Eaton’s Lexi Miller makes a diving catch during the Eagles game with Oakwood on Friday, April 6. 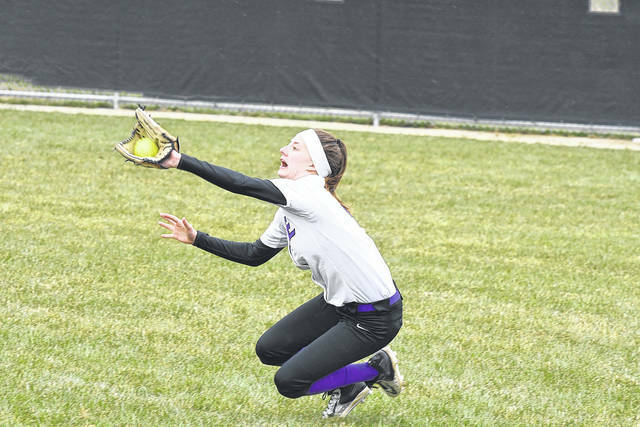 The catch helped preserve a no-hitter for Annika Gels. Eaton won 16-3 to improve to 4-0 overall and 2-0 in the Southwestern Buckeye League’s Southwestern Division. Eaton junior Annika Gels pitched her first-ever perfect game as the Eagles shutout Oakwood, 13-0, on Thursday, April 6. Gels struck out 12. 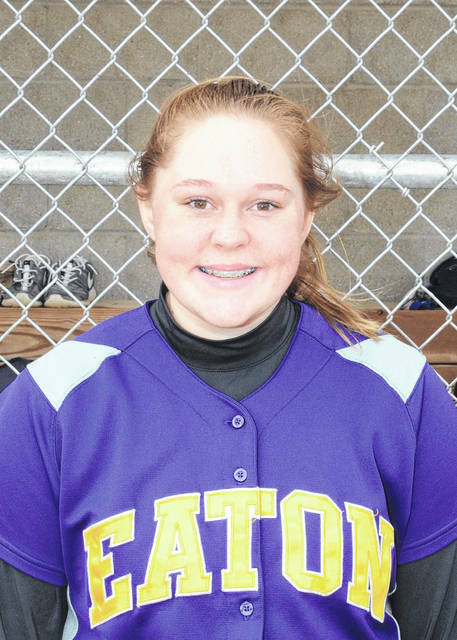 The next night, she tossed a no-hitter and struck out seven as Eaton beat Oakwood again, 16-3. The perfect game is believed to be a first in program history. EATON — Throwing a no-hitter is a tough task to accomplish. Throwing a perfect game is even more difficult. 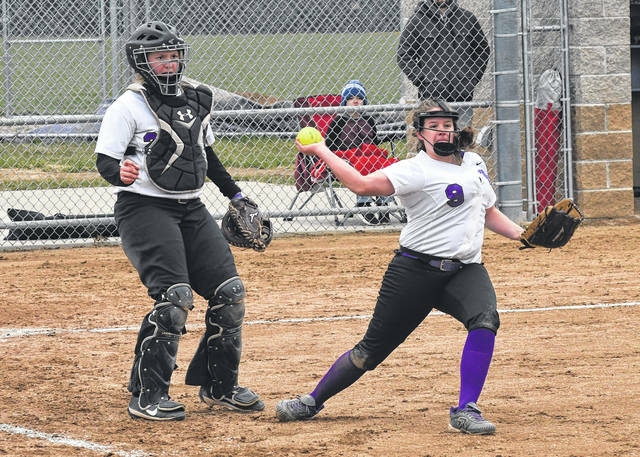 Eaton’s softball team celebrated both feats last week on back-to-back days, as junior pitcher Annika Gels dominated Oakwood and claimed 13-0 and 16-3 wins. 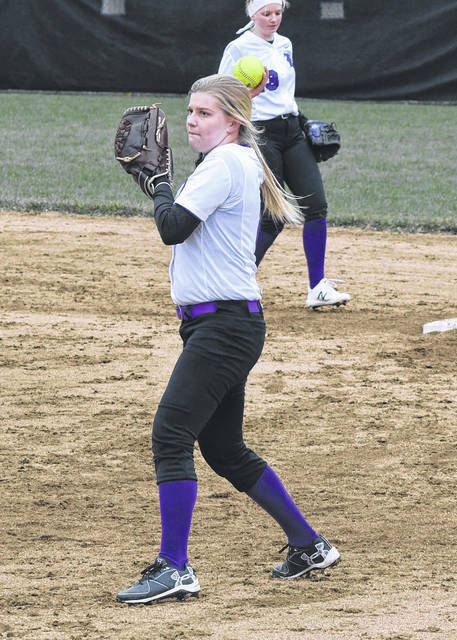 To make the accomplishments even more special, Eaton’s junior varsity pitcher Carsyn Lammers also pitched a perfect game the same day as Gels. According to a spokesperson with the Ohio High School Athletic Association, the OHSAA does not keep junior varsity records, but he was unaware if any other schools in the state had ever pitched two perfect games at the varsity and junior varsity level on the same night before. Gels pitched the first perfect game of her career on Thursday, April 5. She struck out 12 and allowed just three infield ground balls for the other three outs in the 13-0 win. Neanen said she had never been a part of a no-hitter, let alone a perfect game. Gels and the team tried to downplay the perfect game. Eaton scored early, plating a pair of runs in each of the first two innings for a 4-0 lead. They added another run in the third and six more in the fourth. As a team, Eaton collected 15 hits. Bailee Worley went 2-for-3 with 2 RBIs. Lexi Miller was 2-for-3 with four RBIs. Ashley Earley was 2-for-3 with two RBIs. Rilee Worley and Bailey Sheperd each added a pair of hits. “Our goals are set on winning league and it was just one more league win that we have,” Gels said. 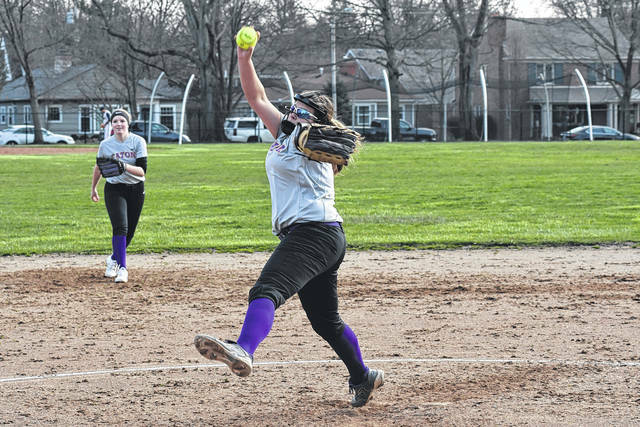 The next night, Gels struck out seven in the no-hitter as Eaton improved to 4-0 overall and 2-0 in the Southwestern Buckeye League’s Southwestern Division. Gels retired the first nine batters of the game, before an error allowed the Jills their first base-runner. Eaton scored three in the first, four in the second and two more in the third to take a 9-0 lead. Oakwood finally scored a run in the fourth on an error and tallied two more in the fifth aided by Eaton misplays. Not only did Gels pitch well, she had solid night at the plate, going 3-for-4 with a home run and two doubles. Mowen was 3-for-4 with two RBIs and Miller went 2-for-2 with an RBI. While Gels was throwing what is believed to be the first perfect game in program history at the varsity level at Oakwood, Lammers and the junior varsity team were doing the same at home. Lammers struck out eight in the 27-0 win. Neanen said it was a special night for Eaton softball. Eaton was scheduled to play Brookville on Monday, April 9 and Franklin on Tuesday. The Eagles will visit Brookville on Wednesday, Bellbrook on Thursday and Monroe on Friday. They will close out the week with a trip to St. Henry for a doubleheader on Saturday. This entry was tagged , Eaton softball, Oakwood, OHSAA, perfect game. Bookmark the permalink.